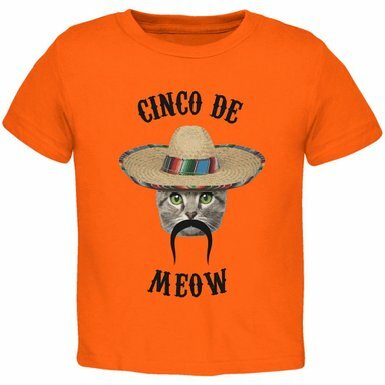 can have this funny Cinco de Meow T-Shirt on hand. Not only can you honor Mexico's independence, but you can let your kitty freak flag fly. Not only that, a t-shirt is an easy clean up from all that cerveza you spill on yourself at the cantina. Don't make this holiday just another excuse to drink! Make it about los gatos! Yeah. Cats with moustaches! This t-shirt is 100% cotton for cool comfort and is available in several different colors for both men and women. To order your Cinco de Meow T-Shirt, click here.